Instead of a top crust, this pie has a cinnamon-ginger streusel that gives it an old-fashioned look and taste. Try this treat in place of an apple pie at your next holiday meal. For Filling: Combine pears, orange juice concentrate and lemon peel in a mixing bowl; toss lightly. 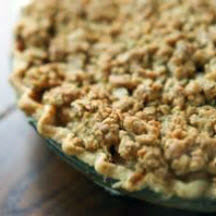 Arrange pear mixture in pie crust. For Streusel: In a separate bowl, combine flour, sugar, cinnamon, ginger and salt. Cut in butter until crumbly, then sprinkle over pear mixture. Bake for 40 minutes or until pears are tender. Cover the top loosely with aluminum foil after 30 minutes if too brown.